UNA offers our Executive MBA through partnerships with Pepsons Education Consulting Co. Ltd. in Suzhou and IUC Global Corporation in Taipei. The Executive MBA program’s course offerings and program requirements are the same as those offered at our Florence, Alabama campus. All professors who teach are UNA faculty members approved by our Graduate Council. Instructional materials are available in Chinese and English. Students will learn in class and online. Many graduating students come to Florence, Alabama to be a part of their commencement ceremony. When students come to our Florence campus for graduation, special events are set up for them to network with local business people to continue their connection to UNA. 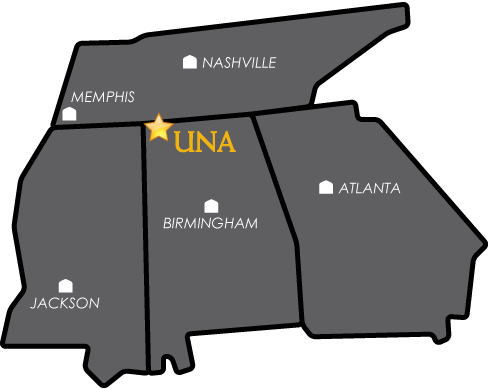 Our partners assist with recruiting students and providing administrative services for UNA. We invite you to learn more about how you can be a part of our program by contacting Pepsons or IUC or contact us at the numbers noted to the left. Enter your information below to get started on your MBA.